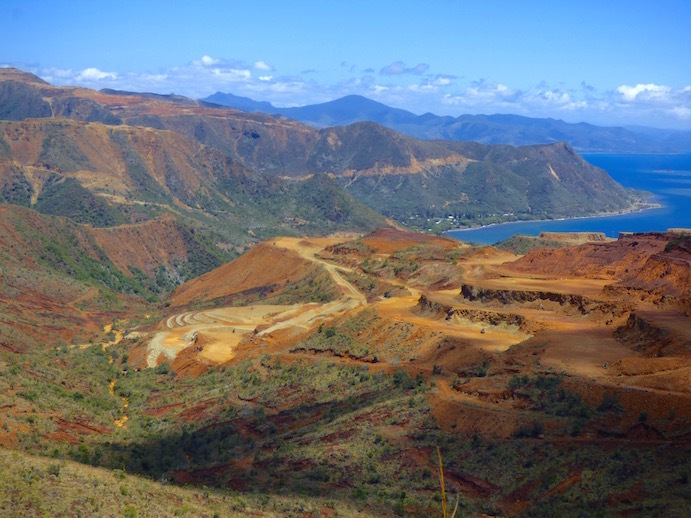 Mining... the dominant landscape feature of our road trip, day 4, New Caledonia, from Canala to the East Coast. We knew curvy mountain roads would make for slow travel and lots of stops so we got an early start from Canala. Our goal was to arrive in Hienghene (pronounced "yang GANG") early enough for a late afternoon campsite setup at Babou Cote Ocean. 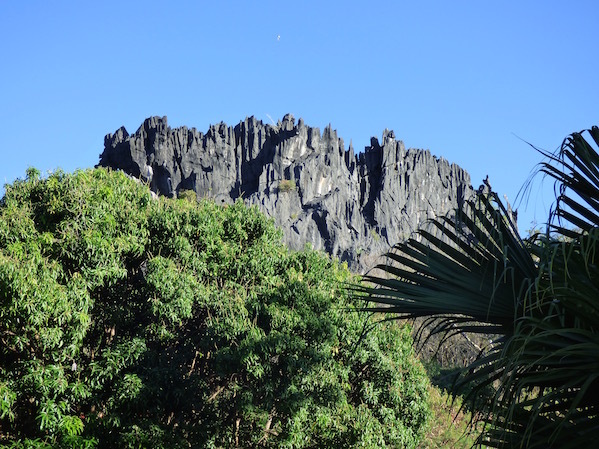 We found it amazing there was spring water in these arid New Caledonian mountains west of Kouaoua. from our side-road lunch stop. 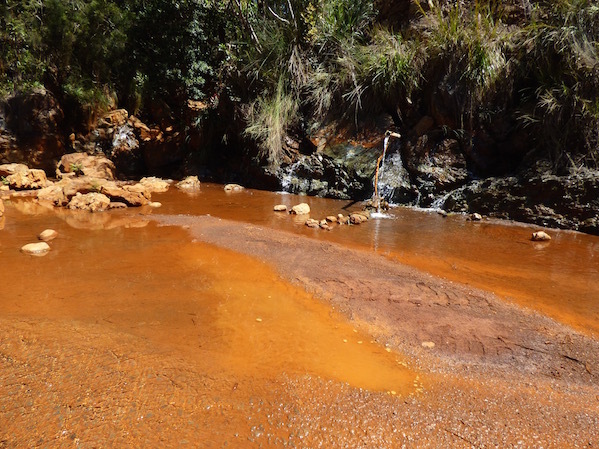 Once again we witnessed the terrible stark beauty of New Caledonia's red-orange earth stripped bare through miles and miles from mining. 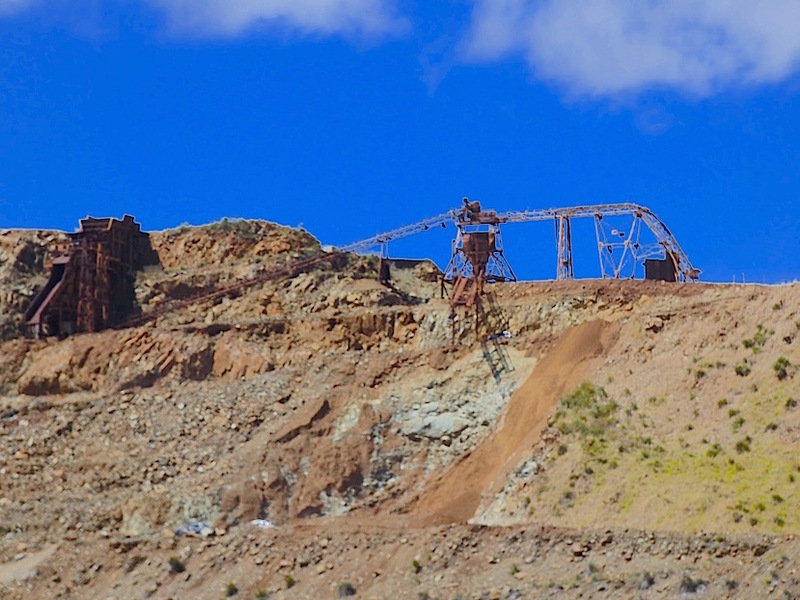 As we threaded our way through the mountains, we arced around the same mine processor, seen from many angles across the deep surrounding valleys. At a number of points, the road crumbled at the edge. Finally, just before descending into Kouaoua, we observed a former hillside, now quarry carved to the point its original form was far past recognizable. Getting closer... New Caledonia headed toward Houaoua. Holy cow that's one carved up hillside! 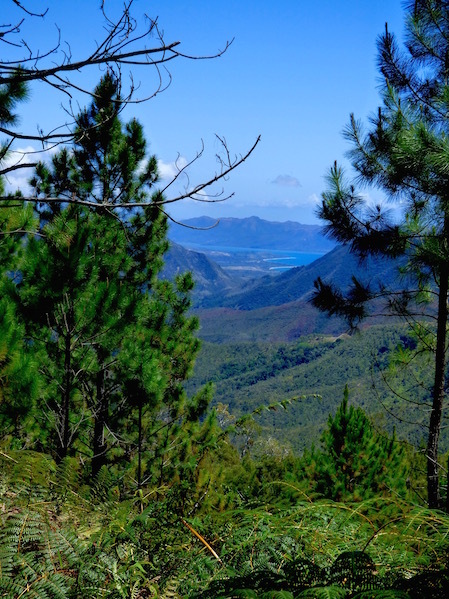 Just above Kouaoua, New Caledonia. We passed through the coastal towns of Kouaoua, Houailou, Ponerihouen, Poindimie (an important stop for refueling, and where we noticed the touted Tieti Hotel and Resort appeared closed), Iouho and a number of smaller towns. 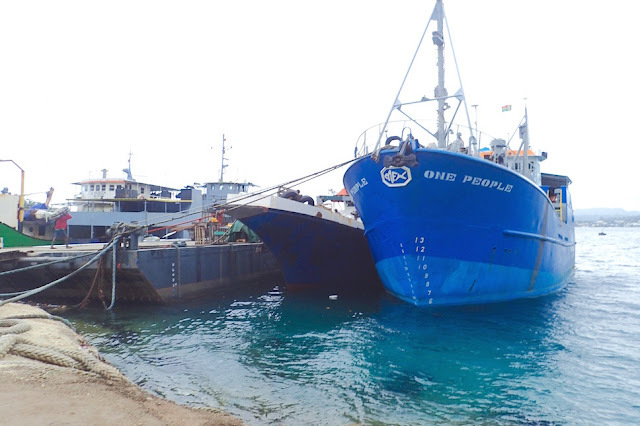 At last, we arrived on the outskirts of Hienghene, and Babou Cote Ocean dive/camp site. Hienghene's minarets in the magical hour or so before sunset. New Caledonia's East Coast. We set camp and took the roadside/beach trail walk to get a better sense of Hienghene's natural beauty, best done at low tide, which happened to coincide with our walk. Babou Cote Ocean Hienghene in came highly recommended by the visitor center and as well one of the road trip articles noted it was the less expensive campground. I was looking forward to wifi and hopefully a kitchen with a stove. The staff was incredibly nice. However, while "campsites on the beach," sounds dreamy, it's really an open area in a flat dusty field right next to the beach -- our least favorite campsite of the three on our trip, by far. The campground was $15; definitely not the cheap camp site. A more primitive but also more scenic campsite down the road was $5, though not sure if that was per person or per tent. The wifi wasn't working. Nor was it at the hotel down the road where it came "free" with a $4 cappuccino. No stove, though there was a billy for hot water in the morning, and there was a small camp freezer, which we happily used. There were flush toilets and cold showers, and a covered double shared picnic table, popular with smokers, otherwise not much in the way of seating. as cute when she tried to drag away my salami. 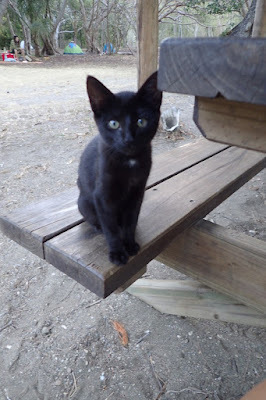 The resident black kitten charmer was the highlight of Babou Cote Ocean for us, even if I had to resort to Wayne's assistance to keep out salami from getting dragged away while I was chopping other ingredients for our Italian-style bean-salad supper. The visitor center mentioned Babou Cote Ocean was a good place to snorkel. Maybe on a calmer day the snorkeling is more impressive, but the visibility was pretty rotten when I snorkeled. My hunch is the good stuff is what you pay the ~$50 or so for for the campground's dive center to transport you to a nearby islet for diving or snorkeling. 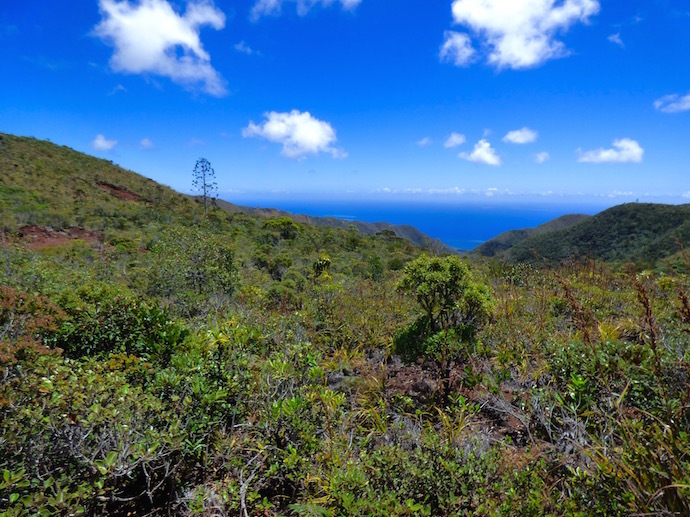 If I was into spending more time and paying for a snorkel transport and tour, Babou Cote Ocean seemed competent, friendly and well-equipped. Thus, after a brief snorkel and foiled wifi, we drank our instant coffee, took our frozen water bottles, and moved on. RT Day 3: Farino to Canala, departed campsite at 9:45, several stops / hikes, arrived at campground ~ 5pm, 91 km (56 miles). RT Day 4: Canala to Hienghene, departed at 7:30 am, backtracked ~20 km, made lots of viewpoint stops, arrived at campsite around 3:30 pm, 261 km (162 miles). Tuesday's plan.... New Caledonia to Bundaberg Australia.... likely 1 1/2 week 24/7 trip for us. but before we get to Australia. 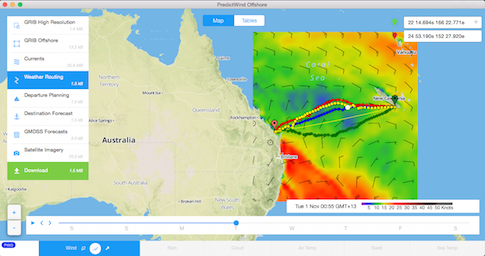 We plan to catch a safe sailing weather window - likely early next week to Australia, about a 1 1/2- 2-week ~760 mile passage. We're already checked out as New Caledonia's government offices are closed until Wednesday morning for a holiday. 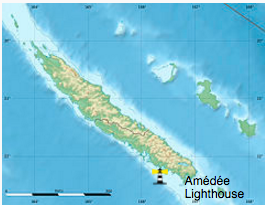 We plan to stop at Amedee Lighthouse in New Cal before we give our final goodbye to this lovely country, and likely at least one more spot to wait before crossing. We'll be out of wifi range by the time you read this, until we're set-up for wifi again in Australia. This is pre-posted catch up posts on New Cal for you to read while we're underway. Once in Oz, we'll check in at Bundaberg, then travel South down the East Coast to Pittwater, near Sydney where we'll park Journey. 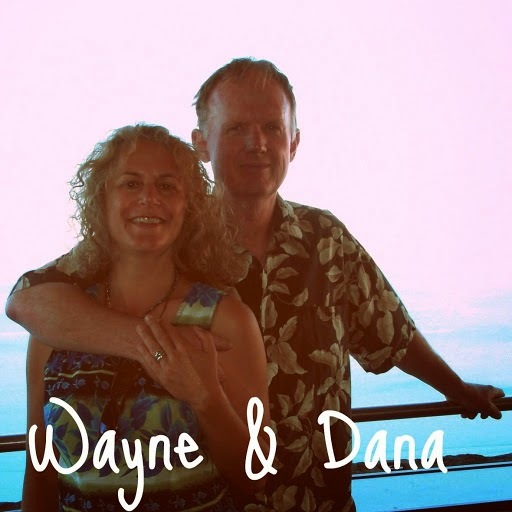 We'll travel over land there for a bit and figure out where to go back to work somewhere in the world. Job tips are appreciated!